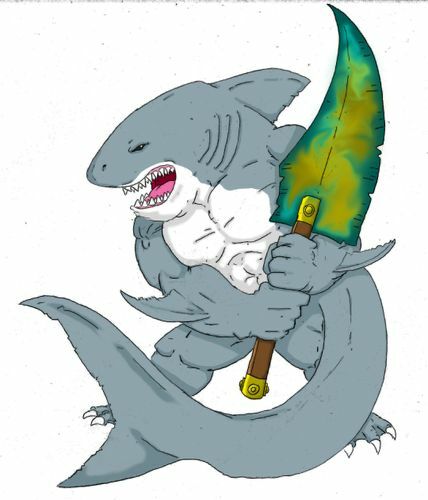 Appearance: Large man-like sharks, they use heavy blades fashioned from shipwrecked hulls and their carnivorous teeth to leave a trail of murder in their paths. Bloodscent (passive)- When next to injured characters (w/o full health), this character gains +1 CC. Cannot use in conjunction with Savagery. This ability cannot be used on ARMS and Autonoma. This character can move adjacent to an enemy and make a CC. First roll one die. If the result is 1-3 (Predator has -1 CC during the attack), if the result is 4-7 (Predator uses normal CC), or if the result is 8-10 (Predator has +1 CC during attack). Cannot move and attack an enemy this character is already adjacent to. This character can spend one movement to move 2 water tile squares. This character cannot spend one movement to move one water tile and one clear tile. Predator a slight bump in Move, maybe a 6 at Elite? The CC needs to scale with level. I'd say CC 3 at Recruit/Veteran and 4 at Elite. I could also see maybe giving him a bump to 3 Health at Recruit. This really needs to be renamed. Wave Runner conjures a silly image of the Predator actually riding a wave runner to me. Otherwise the ability is fine. To be clear, as written this ability won't be able to be used in conjunction with Savagery. I just want to confirm that is the intent (I think it should be). Cost: This is a difficult one to price. If the Deep Ones couldn't create water, this ability would be very limited (and therefore cheap). It will be interesting to see how often water is created, since it provides multiple options to the Deep Ones. I'm thinking Move *0.33 for the cost for this, but we may need to tweak it. As an aside, we need to think about Water movement for all the other Deep Ones...are they going to be slowed down by Water Terrain (surely they shouldn't even if they don't get the extra benefit of Wave Runner). SO we may have to intriduce a separate passive Water movement ability or create an ability that all the Deep Ones get. When next to injured characters (w/o full health), this character gains +1 CC. Cannot use in conjunction with Savagery. This ability cannot be used on ARMS and Autonoma. This ability is really cool...but I'm trying to figure out when this ability would ever be relevant as a passive ability if it can't be used in conjunction with Savagery. There's no situation where you just wouldn't choose this to be your attack ability when applicable if you can't use Savagery, so making it passive redundant/unnecessary. Cost: As always, situational abilities are hard to price. Almost certainly this will be a combo ability where you try to injure a character with someone else and then follow-up with this ability. This ability scales in utility as the opponent gets more powerful (as it is more likely they will be injured). In general, I'm thinking cost should be equal to CC. So as written this is Charge with a random chance to do less, equal to, or more CC damage than a normal attack. I'm ok with that, but I think the likelihood of doing less damage should be reduced. So maybe 1-2 equals -1 CC, 3-5 equals normal CC, and 6-10 equals +1 CC. If the Predator begins its turn adjacent to an injured character, it must spend its turn making a Close Combat attack against the character. This character can choose the target of the attack if there is more than one injured characters adjacent to the Predator. This character receives a +1 CC for the attack. All names of abilities are just placeholders, so by all means, if anyone has an idea please submit. Puddle Hopper? Could we do that? Give ALL the Deep Ones a passive ability that lets them move through Water Terrain without penalty? I say make it a combo ability. So you can use Savagery and Bloodscent together. So essentially, if using Savagery to move and CC an injured player, the Predator would gain +1 CC from Bloodscent, then roll for Savagery to possibly modify CC again depending on result. Its not a huge issue, as there is a chance that you roll 1 or 2 to cancel that Bloodscent bonus. At the most you would have +2 CC with Bloodscent and Savagery on an already injured unit. Kinda fits in with the frenzied attack of a shark. Sounds like a good number modification for Savagery. I like this idea, gives the Predator a more unpredictable nature. A drop of blood in the water will make sharks go into a feeding frenzy. Perhaps the ability could be called Feeding Frenzy. Well, you have Savagery, a modified charge with a possibility of adding +1 CC on the attack. Then Bloodscent, +1 CC when next to an injured unit (which combines with Savagery). Then with Feeding Frenzy, +1 CC and must Close Combat if Predator begins next to an adjacent injured character (does this combine with Bloodscent as well?). Should it replace one of the other abilities? By the way, I like the card design. The Deep Ones symbol works fine for me. Whats the radiation symbol next to it for? The background and colors work out nicely. Maybe a little more transparent behind the character image to let more of the background through? Not sure, would have to see to determine. To be honest I think this character would be better with other abilities, more related with the Shark nature, so I have some proposals. Tail thrust - When movement ends on a water tile, Predator can do a free movement jump to any 2 tiles radius and a CC. When a enemy is wounded, predator can make a 1 move into his direction. This is valid even predator is engaged and with Tail thrust. That changes would give predator deep abilities and another level of strategic value, making water tiles very interesting to the player. - If the Predator begins or ends movement on a water tile, the Predator can do a free movement 'jump' to any 2 tiles within the radius of the Predator and perform a CC attack on an adjacent enemy character upon landing. This 'jump' can be over difficult and elevated terrain, and he may land on elevated terrain but not difficult terrain. And I like the idea of a passive ability that ALL Deep Ones characters have that enables them to move through water terrain without penalty. I really, really like the idea of this ability. The only concern I have is that it introduces a new aspect to the action economy of the game - a sort of "reaction" that no other character has. I almost consider this a sort of experimental ability concept. What do you all think? As an alternative, we could give the Predator a WR (with a pretty high number, but no RC) and let his Bloodscent or Bloodthirst ability allow him to make a Charge against any injured character within his WR - it would essentially be a cheap version of Charge. Great, we need more of these, we just need to make it so simple that gamers would not have to memorize it. Why I think we need more? Because every factions should have at least one 'special' ability, making unique and totally different. This is crucial with several factions. And I think we will end with a lot of factions. And I like the idea, hate the idea of several unit, because in the end is about the same unit in a different suit. But with factions (with a reduced number of units) it works, and works even better if each faction have one or two unique abilities. They just have to be simple. Like In the case of the Deep Ones, their faction ability allows them to ignore the typical penalty for moving into Water Terrain squares, it's simple and logical, you look to a sea creature and you immediately assume that they would move in water without penalty. Its so natural that even to a player that plays for the first time understand. So the Predator picks up the scent of blood in the air and races off towards it. Theme meets mechanics Sounds great! Great, we need more of these, we just need to make it so simple that gamers would not have to memorize it. Just so I understand, do you mean we need more of these as in reaction abilities or more of these as in unique mechanics? I'm ok with either, I just want to make sure I know where you're going. At one point in STA's development, I thought about including an entire Reaction system, but then dumped it due to the KISS principle. I think the idea of reaction type abilities could be interesting as long as there are just a few and they are very, very simple. Sounds good. We have a LOT of various different ideas floating around for the Predator in this thread. Unlike the Tidehunter and Nautilus where we all sort of came to an agreement on the abilities we thought would work best, there are still a lot of different competing ideas for this guy. 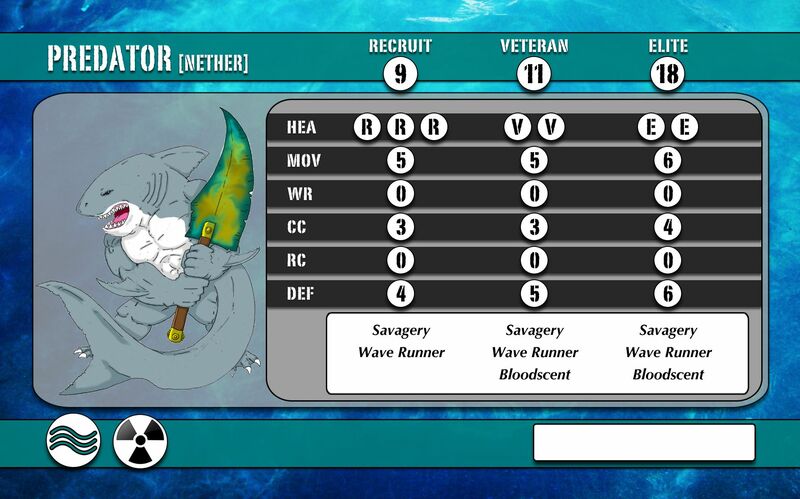 Once we hammer down the final proposed abilities, I'll generate a character card for the initial playtests. So what are everyone's final thoughts on what they'd like to see the Predator have? I like the newest version of Bloodscent. As you have listed above. Give him very wide WR just for this ability. It enables him to 'smell' blood and to Charge towards that injured unit. So move and close combat, but only to 'bloody' targets. Correct? It is of course limited, as it only gives him the advantage against injured opponents. So maybe Savagery should be replaced or changed, as that also grants a bonus to CC but only against 'injured' opponents as well. Multiple close combat attacks, but only one attack per adjacent units? +1 CC against adjacent 'injured' opponents. Important it's that abilities be intuitive and better if it is simple. By bloody you mean human type, right? It looks quite powerfull, but it could be 'controlled' with some strategic choices. Well, it's less powerful than just a normal charge ability...it requires that the target is within WR and injured. Jeff: This character can spend one movement to move 2 water tile squares. This character cannot spend one movement to move one water tile and one clear tile. David: This really needs to be renamed. Wave Runner conjures a silly image of the Predator actually riding a wave runner to me. Otherwise the ability is fine. To be clear, as written this ability won't be able to be used in conjunction with Savagery. I just want to confirm that is the intent (I think it should be). Jeff: When next to injured characters (w/o full health), this character gains +1 CC. Cannot use in conjunction with Savagery. This ability cannot be used on ARMS and Autonoma. David: This ability is really cool...but I'm trying to figure out when this ability would ever be relevant as a passive ability if it can't be used in conjunction with Savagery. There's no situation where you just wouldn't choose this to be your attack ability when applicable if you can't use Savagery, so making it passive redundant/unnecessary. Jeff: I say make it a combo ability. So you can use Savagery and Bloodscent together. So essentially, if using Savagery to move and CC an injured player, the Predator would gain +1 CC from Bloodscent, then roll for Savagery to possibly modify CC again depending on result. Its not a huge issue, as there is a chance that you roll 1 or 2 to cancel that Bloodscent bonus. At the most you would have +2 CC with Bloodscent and Savagery on an already injured unit. Kinda fits in with the frenzied attack of a shark. RT: When a enemy is wounded, predator can make a 1 move into his direction. This is valid even predator is engaged and with Tail thrust. David: I really, really like the idea of this ability. The only concern I have is that it introduces a new aspect to the action economy of the game - a sort of "reaction" that no other character has. I almost consider this a sort of experimental ability concept. What do you all think? (after chatting about this, I feel this could be an interesting experiment into the idea of “Reaction Abilities,” using this as a test case. RT: Great, we need more of these, we just need to make it so simple that gamers would not have to memorize it. Jeff: It is of course limited, as it only gives him the advantage against injured opponents. So maybe Savagery should be replaced or changed, as that also grants a bonus to CC but only against 'injured' opponents as well. RT: By bloody you mean human type, right? Jeff: This character can move adjacent to an enemy and make a CC. First roll one die. If the result is 1-3 (Predator has -1 CC during the attack), if the result is 4-7 (Predator uses normal CC), or if the result is 8-10 (Predator has +1 CC during attack). Cannot move and attack an enemy this character is already adjacent to. David: So as written this is Charge with a random chance to do less, equal to, or more CC damage than a normal attack. I'm ok with that, but I think the likelihood of doing less damage should be reduced. So maybe 1-2 equals -1 CC, 3-5 equals normal CC, and 6-10 equals +1 CC. Jeff: +1 CC against adjacent 'injured' opponents? Jeff: I like this idea, gives the Predator a more unpredictable nature. A drop of blood in the water will make sharks go into a feeding frenzy. Perhaps the ability could be called Feeding Frenzy. Jeff: Multiple close combat attacks, but only one attack per adjacent units? RT: When movement ends on a water tile, Predator can do a free movement jump to any 2 tiles radius and a CC. Wave Runner: Not really useful now due to the Deep Ones faction ability. Bloodscent (original, passive version): ok, but not really tactically intriguing. Bloodscent (RT's version, Reaction ability): Interesting; not very powerful but would introduce some interesting tactical choices. Check my suggestion below for integrating with a more powerful ability. Charge/Bloodscent: I like this ability, but we can probably improve it by combining it with Savagery and then simplifying them both (see below). Savagery: I'm not sure the rolling mechanic really adds to the theme, it definitely adds a luck component, and it just slows things down a little. How about a possible merge with the Charge ability (see below). Feeding Frenzy/Frenzy: Jeff, were you suggesting that we change the ability to that it targets ALL adjacent characters, not just one? If so, it basically becomes the Frenzy ability used by the Abomination (Order faction). Tail Thrust: To be honest I'm not a huge fan of this ability. For me it just doesn't resonate with the character, but I'm ok with it if that's the group's decision. Bloodscent: If an enemy character within this character's Weapon Range and line of sight takes damage, this character can immediately Move to the character and make a Close Combat attack with a +1 CC. When using this ability, this character can withdraw from enemy characters without granting enemy characters free Close Combat attacks, and this character does not have to end its Move if it moves adjacent to an enemy character. This character can only use this ability if the character has not already taken an action during the round, and using this ability counts as the characters action for the round. This ability cannot be used against Autonoma and ARMS. Savage: If the Predator begins its turn adjacent to an injured character, it must spend its turn making a Close Combat attack against the character. This character can choose the target of the attack if there is more than one injured characters adjacent to the Predator. This character receives a +1 CC for the attack. (I know that you wanted this to be called Feeding Frenzy, Jeff, but I think that's too close to the Order's Frenzy ability...I think Savage makes for a logical name, but we could go with whatever you like). Quick thought. What happens when u are next to an injured character and there's another injured character in your WR and LOS. Can you use bloodscent to move away since the description says that you can move away without getting attacked. However, the description for savage says that you must CC the adjacent person. So how??? Also, when u are next to an injured ally, must you CC him? Logically, his savage nature and bloodscent should make him do so, but of course, its not advisable. So how should we settle these two problems especially the first? Bloodscent is a reaction ability. So basically, if the trigger occurs (an enemy character is injured), the Predator could immediately take his action to move to the injured character. Note that this ability is unique in that as written it actually allows you to change the action economy of the game. For example, If a player takes his second action for a turn and injures an enemy character, the Predator can immediately use the Bloodscent ability. This essentially grants the player a third action during the turn (though the Predator can't use an action later in the turn). If we decide to do away with the reactive nature of the ability, we could just use the ability as written (minus the reactive trigger) as a modified charge. In that case, the player wouldn't be able to use the ability if the character is adjacent to an injured character, because the player would be forced to use Savage first. As written, we'll have to clarify which of the two abilities trumps the other. I'm leaning towards saying a Predator can't use Bloodscent if he's already adjacent to an injured character. Note that the drawback of Savage is intentional. So yes, if he starts his turn adjacent to only one injured character and that character is an ally, the Predator still has to attack with Savage. Bloodscent should only be activated by creatures with human blood. Predator only moves in direction of a new fresh blood wound (when some one is hit) and his mandatory (one move). Even Predator is in CC with a wounded character, and other character is hit, predator will go in that direction. If in that single move, predator reaches the wounded or is in CC with that unit (and the wound wasn't made by a predator), predator makes a free CC. My point of view. It would be very fun to use other units to make predator move. Looks like some final clarification on abilities are still needed for the Predator. As well, any other ideas for the character name? Here were the proposed abilities for the Predator. Here was a variation to Bloodscent. I like the visuals for the Predator and I want to be sure the mechanics fit the character. So we still need to discuss the Predator, but for now, here's an updated character card. Bloodscent: If an enemy character within this character's Weapon Range and line of sight takes damage, this character can immediately Move to the character and make a Close Combat attack with a +1 CC. When using this ability, this character can withdraw from enemy characters without granting enemy characters free Close Combat attacks, and this character does not have to end its Move if it moves adjacent to an enemy character. This character can only use this ability if the character has not already taken an action during the round, and using this ability counts as the characters action for the round. This ability can only be used against Animal, Human, Nether, and Paranormal characters. Savage: If the Predator begins its turn adjacent to an injured character, it must spend its turn making a Close Combat attack against the character. This character can choose the target of the attack if there is more than one injured characters adjacent to the Predator. This character receives a +1 CC for the attack. This ability can only be used against Animal, Human, Nether, and Paranormal characters. Predator doesn't have WR so technically he can't use bloodscent yet. We should add a wr and i'm thinking it should be somewhere near his movement? Also, i think we should specifically say that Bloodscent can override Savage. I think that should be LOS and MOV instead of LOS and WR.